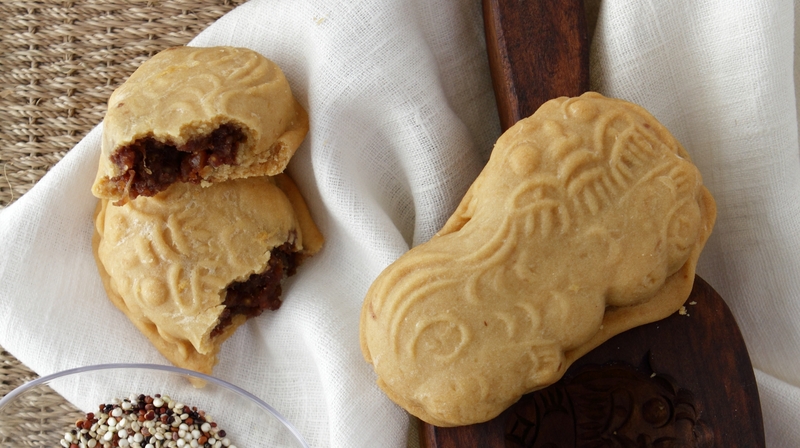 IF you’re looking for a delicious, yet healthy alternative to commercial mooncakes, try making these biscuits instead. This recipe was first published in Flavours magazine. Combine the golden syrup, oil and water. Cover with cling film and leave to stand for 1 hour. Sift in the flour and mix to form a soft, sticky dough. Cover with cling film and leave to rest for 1 hour. If the dough is still sticky, add a little more flour. Divide the dough into 35g portions. Place the millet and the water into a pot and boil until millet is cooked. Place the millet, red beans paste and orange peel into a bowl. Slowly stir in the roasted glutinous rice flour. Divide into 35g portions. Beat all the ingredients together using a whisk until well combined. Set aside. Take a portion of dough and roll it out. Wrap it around a portion of filling. Dust some flour into the animal mooncake mould and knock out the access flour. Press the filled dough into the mould. Knock out the mooncake and arrange it onto a greased tray. Place into an oven pre-heated at 170°C and bake for 10 minutes. Remove from oven and brush the mooncakes with a thin layer of egg wash. Return it to the oven and bake for another 10 minutes. Remove from heat and leave to cool before storing. Best served after 2 days and eaten within 10 days. Do note that you will need an animal mooncake mould.